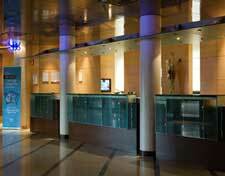 The NH Bologna Villanova hotel combines a high standard of comfort at a great price value. The hotel is located just a few kilometres from the airport, the historical district and close to the motorway. The 209 rooms have all been elegantly designed and are the perfect place to relax. The charming covered swimming pool with a relaxation and fitness area lets you indulge yourself or help you get your daily workout. NH Bologna Villanova features a free wi-fi internet connection available in the common areas and an innovative automatic catering service, allowing guests to purchase hot and cold food and drinks 24 hours a day. In addition the hotel offers a snack bar, a free outdoor parking, a garage connected to the main building, and a 5 room conference center equipped with the most up to date technology. The NH Villanova Hotel�s congress center is composed of 5 meeting rooms, all of which have plenty of natural light and are equipped with the most advanced technology. They can cater to up to 350 people. There is an external car park and an internal garage that's directly connected to the hotel for our guests. Our excellent staff and extremely efficient service ensure that all types of events held at the hotel will be perfect.